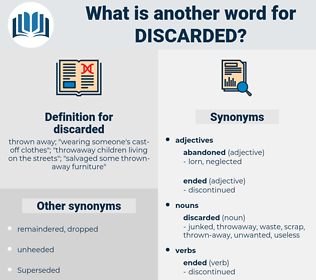 What is another word for discarded? 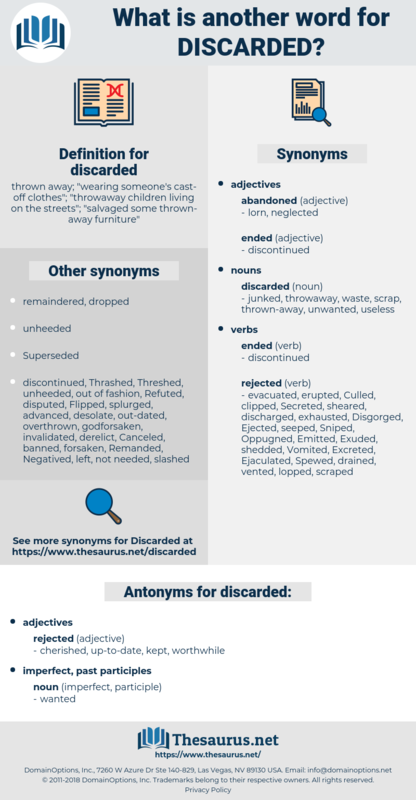 thrown away; " wearing someone's cast- off clothes"; " throwaway children living on the streets"; " salvaged some thrown- away furniture"
disregarded, Disallowed, Disagreed, repudiated, Refused, Eliminated, ignored, Switched, Renounced, Discounted, forfeited, dipped, Overruled, Slid, Deviated, Refuted, departed, dumped, Deposited, Created, flushed, pointed, opposed, cast, established, laid, Denied, Shunned, Tossed, blamed, Provided, set, Objected, stuffed, Brought, lay, defeated, ruled, shut, kicked, damaged, put, Looked, Took, shed, dismissed, rejected. discontinued, disconnected, Disallowed, Displaced, Sacrificed, Ceased, Forwarded, disqualified, Eradicated, dismantled, withdrawn, dispensed, considered, rid, scrapped, repudiated, decommissioned, dissolved, Rescinded, disowned, distinguished, removed, invalidated, addressed, terminated, exterminated, discharged, Erased, Awarded, relinquished, Ostracized, Avoided, marginalized, Liquidated, obliterated, Refused, bypassed, directed, surrendered, stopped, cancelled, Canceled, Deprecated, Eliminated, Trashed, Abdicated, Superseded, Decimated, grandfathered, Curtailed, Slaughtered, ignored, annihilated, demolished, Arisen, forsaken, jettisoned, destroyed, Excluded, Waived, rehabilitated, Overridden, Resisted, deferred, Ditched, Abolished, Extirpated, Renounced, reintegrated, hidden, spread, Forsworn, Deleted, Discounted, severed, corrected, void, Voided, withheld, ruined, forfeited, Vacated, Excreted, Annulled, Omitted, retired, accepted, modified, Transferred, left, Remedied, Stigmatized, Circumvented, suppressed, evacuated, negated, abandonned, reversed, Abrogated, Overruled, Strayed, Aborted, Evicted, suspended, Declined, washed, unlocked, condemned, Reaped, Precluded, failed, revived, Averted, added, stranded, Denounced, recovered, Revoked, furnished, accompanied, exited, dumped, sent, repaired, forgotten, Deposited, sidelined, nullified, Created, whacked, wasted, concealed, deserted, Repaid, Screened, cleaned, Delivered, overturned, Forgiven, stripped, Slipped, overlooked, flushed, revealed, Expelled, Quashed, torn, Achieved, attached, Generated, Demoted, turned, marooned, quit, Quitted, overcome, handed, Rebutted, opposed, donated, expired, produced, cast, rectified, Prevented, established, Bridged, silenced, restored, Upheld, Ousted, thrown, laid, frayed, lost, Denied, neglected, spurned, checked, smashed, Repelled, Tossed, Tackled, Repealed, Shifted, struck, pursued, embedded, blamed, Fled, contested, burned, elicited, Passed, phased, Rebuffed, spent, balanced, Provided, Tendered, Repulsed, exhausted, Hurled, Culled, undone, missed, Batted, reunited, varied, pinned, Remitted, cleared, set, Devolved, Emitted, Purged, dequeued, reopened, barred, Pushed, buried, placed, reunified, resolved, defeated, vented, untied, Exempted, blocked, fired, found, Abated, lifted, Yielded, orphaned, stored, built, driven, Resulted, Obscured, wired, Expunged, Borne, ruled, Dealt, offset, paved, busted, extended, kicked, pulled, party, controlled, Benched, put, Returned, Looked, run, cut, shed, dismissed, rejected. So true is this that, as time went on, my ideas cleared and the plan for which I was seeking unfolded itself before me from the day I came upon a discarded bow lying open to view in the museum cellar. Released, the porter went on to gather up a pile of discarded papers. decreed, desecrated, dasyurid, Daucus Carota, dasyuridae, deserted, degraded, disaccord, disaccharide, djakarta, discord, dogcart, decorated, dog-eared, discard, discredited, ditch reed, desegrated, discredit, dissertate, desert, dessert, discrete, degree day, decorate, desired, dockyard, discreet, desecrate, disarrayed, degrade, disagree with, dose rate.